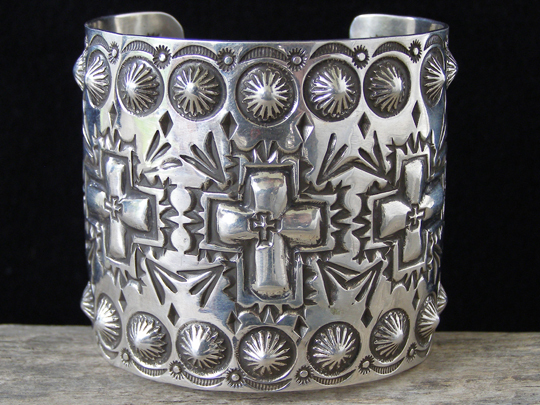 Ronnie Willie Stampwork Sterling Repousse� Bracelet size 7 1/4"
Navajo silversmith Ronnie Willie made this nicely stamped cuff from Sterling sheet metal. He decorated this uniform-width cuff with repousseé crosses and a row of starred buttons along each edge. Wonderfully wide and beautifully textured! Hallmarked Ronnie Willie with an arrowhead. Uniform width of cuff: 2 3/8"